129 Main Street by The Properties Group offers true boutique living in the revitalized Old Ottawa East. Marked by quality craftsmanship and a bold design philosophy, the forty-six modern residences exemplify an authentic urban lifestyle situated within an intimate surrounding. Each unit includes features and finishes that are contemporary and refined yet forward thinking. 129 Main Street reflects the identity of a rapidly changing neighbourhood. As one of city’s most desirable urban regions, Old Ottawa East offers the perfect mix between vibrant and private urban living. Find balance with nature at the Rideau Canal just steps away, and live amidst a diverse selection of shops and future amenities of Main Street. Residents of 129 Main Street have an opportunity to choose between three distinct designs – Scandinavian, Italian and New York. While each offers something different, all three designs were created to connect you with the creative artist within. With great attention to detail, our designers thoughtfully brought these themes to life. While timeless, these are unlike any other interior finishes the Ottawa condominium market has seen before. Book your appointment now and reserve your new exquisitely styled home today. We chose the slogan “Live the change” for a reason. 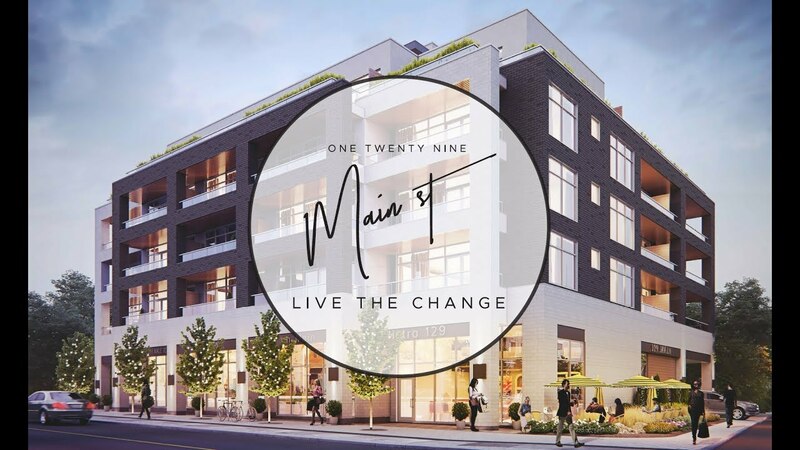 Ottawa is a rapidly evolving city, and 129 Main is bringing change to the neighbourhood of Old Ottawa East. To capture this sprit, we decided to dedicate our list of floorplans to prominent Ottawa change-makers. This selection of names celebrates the city’s rich past and look towards our shared future of continued growth. Roderick Lahey Architecture (RLA) boasts an architectural style that is fashionable yet timeless. The company has more than 20 years of experience in designing, planning, and building communities in Ottawa. The RLA team is made up on experienced, comprehensive and powerful architects, designers, and craft specialists. Blue Panda Realty is a boutique-style real estate brokerage that caters to a growing demographic of progressive Ottawans who value unparalleled client service, distinctive design, and technology. Unlike larger corporate brokerages, Blue Panda is not restricted to drawing within the lines and prefers to think outside the box. Iron △ Ivory interior design firm is a collaborative environment dedicated to creating visions of the highest caliber. With a head office in Ottawa, ON and a satellite office in Toronto, ON, Iron △ Ivory is recognized as a national and international working firm in commercial and residential design. The Properties Group has an impressive 50 years of experience across Ottawa and the Greater Toronto Area. They are committed to providing exceptional value to investors and tenants by employing a collaborative and strategic management approach. Bassi Construcion is renowned for their excellent work ethics and the special relationships they have forged over its past 55 years of business. Bassi has successfully completed numerous commercial and residential communities and office buildings across Ottawa. How do I book a sales office appointment? Private sales office appointments can be booked using the online calendar system found on this webpage. Where is the sales office located? The sales office is located at 1130 Wellington Street West, Suite 4 (corner of Wellington and Rosemount). Be sure to look for the Blue Panda Realty signage in front of the office. Is there a model suite available to view? A model suite is not available to view at this time. However, our guests will be able to experience samples of finishes and features in the sales office. With each unit, we offer the choice between three specially designed palette selections. What is included in the condo fees? The fees include heat and water. As well – cleaning of all common areas, maintenance of the elevator, HVAC, emergency generator, exterior areas and utility equipment, fire protection testing, garbage removal, landscaping, window cleaning, snow removal, insurance, annual and performance audits, all common utilities, administration and file-keeping and an 18% contribution to the Condominium’s reserve fund. What is the cost of a parking space? Each parking spot is priced at $35,000 and each owner will have a dedicated spot. Yes, there will be 2 visitor parking spaces available for visitors of the residents. What is the cost of a storage locker? Standard sized lockers are available for $3,500. A handful of larger lockers are available for $5,000. Yes, there is ample bike storage available for purchase in the basement ($1,000), as well as in the covered parking garage ($750). Each bike storage space will be sold and title for the space will be granted to that owner. What are the projected construction and completion dates? We are hoping to begin construction in early 2020 with the completion date occurring 12-14 months after the team at Bassi breaks ground. Is it possible to combine units in the pre-construction phase? Early purchasers will have the option of combining adjacent units. Please contact the sales team for more information. Is this a concrete building? Yes, 129 Main is a concrete building, providing for a heightened quality of construction. How is interior square footage calculated? The interior square footage is measured from the inside of the walls, meaning the actual liveable floor space provided in your units and on the balconies and terraces. The building is pet friendly within the scope of a 55 lb. weight restriction. Are BBQs permitted on the balconies? BBQs are not permitted on the balconies between floors 2-4. The 5th floor terrace units will be fitted with gas line hook-ups. In addition, common BBQs will be provided on the shared rooftop terrace. Who is the property management company? 129 Main will be managed by The Properties Group Management Ltd., the property management arm of The Properties Group, which currently manages more than 80 commercial and mixed-use condominium buildings. Copyright 2018 © 129 Main Street Properties Ltd. All rights reserved. E. & O.E.